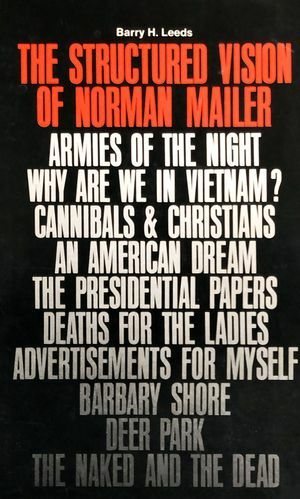 Cover of The Structured Vision of Norman Mailer. In no other writer since Hemingway has a personal image so influenced and clouded critical opinion. This, the first full-length study of Norman Mailer's works, attempts to deal honestly with Mailer the artist. In his examination of Mailer's fiction, Dr. Leeds contends that the artist's thematic concern with the plight of the individual in con­temporary society is a legacy of the thirties, modified by Mailer's unique perspective. Leeds con­tinues with an appraisal of the non­ fiction, tracing the development of the writer's distinctive narrative voice from the early works to the extraordinarily successful The Armies of the Night. BARRY H. LEEDS has his B.A. and M.A. degrees from Columbia University and his Ph.D. from Ohio University. He has taught at the City University of New York, the University of Texas at El Paso, and Ohio University. He is currently Assistant Professor of English at Central Connecticut State College. ↑ The Structured Vision of Norman Mailer is reproduced here with the permission of the estate of Barry H. Leeds. Project Mailer and the Norman Mailer Society would like to thank Ashley Leeds for her kind support of our endeavors.